London gets the Snapbot treament as Snapchat Spectacles launch in EuropeSnapchat is bringing its cute Snapbot vending machines to Europe, letting Snapchatters in the region get their hands on a pair of Spectacles for the first time. The unusual distribution strategy for the camera-equipped glasses follows on from a similar initiative in the US. Here come the Snapbots: Snapchat Spectacles launch in EuropeSnapchat Spectacles are finally available outside the US in multiple countries at once. Here's where to get them. 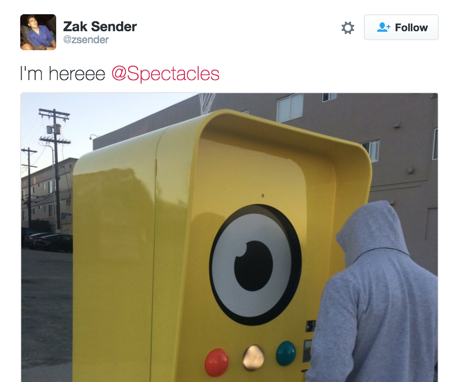 What Are Snapbot Vending Machines?What's the story about Snap's new Snapbot vending machines selling Spectacles? originally appeared on Quora: the knowledge sharing network where compelling questions are answered by people with unique insights. Would you recommend Snapbots to a friend? This has to be the most unique product launch I've ever seen. Time for a trip to Venice Beach 😎. @jackdweck Maybe someone in Santa Monica can help us out? Willing to pay someone to ship it to the east coast. Snapchat (now called Snap) continues to do things differently. Apparently they're distributed their new Spectacles via vending machines called Snapbots. You'll be able to find them located on this map. @rrhoover I had a really hard time understanding what was going on here until I followed your Spectacles link. @rrhoover Big fan of Snap's creative approach towards everything they do. Keeps people eager to know what they'll do next. @rrhoover Agree, the roving Snapbot idea is absolutely innovative. Scarcity of product can turn from excitment to annoyance if they aren't careful. The absence of further locations and information is venturing into overhype territory. This feels very Willy Wonka! The first person has arrived!! https://twitter.com/zsender/stat... From their site and more info: Buying Specs from a Bot is easy! When you find a Bot, press one of the larger circular buttons to virtually try on a pair of Black, Coral, and Teal Specs 😎 When you’ve decided what color you want, insert a debit or credit card to purchase. Snapbots take about 10 seconds to process your transaction. Once you see the Bot’s mouth light up, take your Specs and you’re all set! Don’t forget to grab your receipt 😁 Pro Tip💡: Keep checking www.spectacles.com to find a Bot near you. ❌ marks the Bot! 5 People in Line as of now. I spy a SpaceX sweatshirt. @raj_ventures looks like you got it figured out. If not let me know! @ntmichaud Nate I need two, will pay you for it. Line is rather long and hoping you can help me bro. @raj_ventures I had a friend grab them, let me see if he can get more (no guarantees). I'll keep you posted. Any color preference? @ntmichaud if you know anyone in line I would highly appreciate it. Color black for both or both blue if available, preference for black. Love the launch strategy - unique for sure. Curious to see how quickly resellers start hawking these on Amazon/eBay.